Detailed illustrations tell the story of the industry’s heritage in Oil and Natural Gas – a book from the Society of Petroleum Engineers. Best of all, it can be downloaded for free, thanks to Energy4me. Discovering the story of petroleum – and the many ways it shapes the world – is the theme of this illustrated guide to the industry’s past, present and future. “Our world is ruled by oil. People have used oil for thousands of years, but in the last century we have begun to consume it in vast quantities,” begins the first chapter, which explains one of the world’s largest and most complex industries. Oil and Natural Gas is an educational book specifically targeted for students. 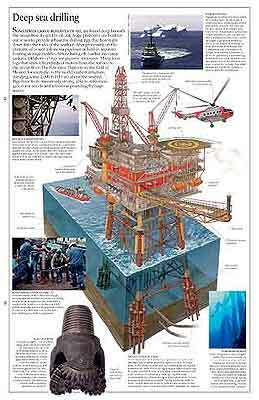 The book, adapted for SPE from a 2007 edition by DK Publishing, London, features such topics as ancient oil, oil for light, natural gas, deepwater technology, piped oil, refineries, global oil, electricity, oil substitutes, and job opportunities. In 74 pages, the hardbound edition offers young people a surprisingly comprehensive introduction to the history and many uses of oil. Detailed illustrations tell much of the story. With more than 79,000 members in 110 countries, SPE shares technical knowledge about the upstream oil and natural gas industry. The society’s energy education website is for students, teachers. Oil and Natural Gas is available at the “essential energy education” SPE website Enery4me, designed to help Americans become more educated energy consumers. SPE members are available to make presentations at a schools — and can provide copies of the book for the library or classroom. AOGHS.ORG welcomes sponsors to help us preserve petroleum history. Please support this energy education website with a donation today. Contact bawells@aoghs.org for membership information. © 2017 AOGHS.